Ok, so I haven't felt like I've had alot of quality blogable material lately, so it's time to resort to useless, yet fun info about myself. I follow Meghan McCain's McCain Bloggette blog (don't judge!) 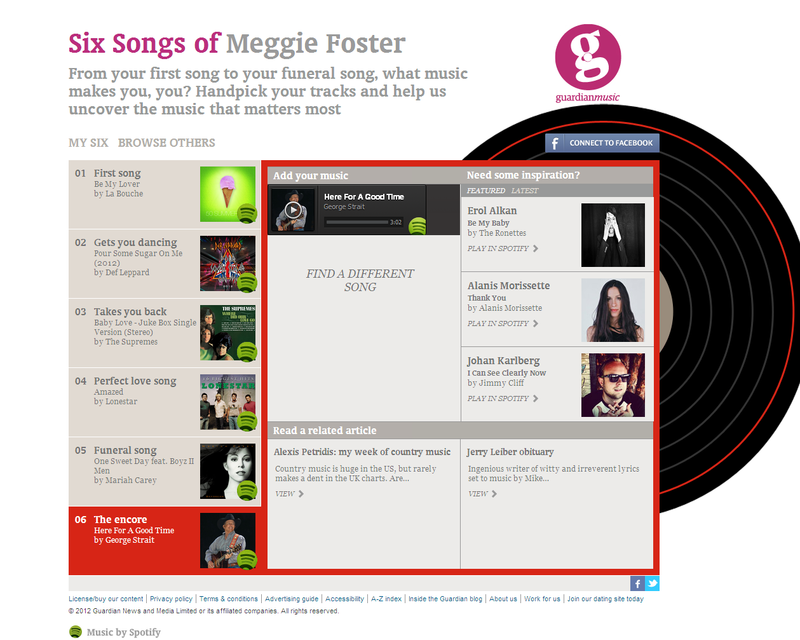 and she recently posted her Six Songs About Me, courtesy of The Guardian. I thought this might be kind of a fun thing to share. The Guardian asks you to choose six songs that have shaped your life. The Encore was a little tough - as there are so many songs that I love and that I feel like describe me pretty well - but I just had to go with George Strait's "Here for a Good Time" because the song describes my laid back yet, positive (for the most part) attitude on life. Life is too short to be grumpy and complain all the time! I'm a glass half full kinda gal! And I'm definitely a George Strait country girl at that! 1. What was the first song you ever bought? 2. What song always gets you dancing? 3. What song takes you back to your childhood? 4. What is your perfect love song? 5. What song would you want played at your funeral? 6. Last, but not least, time for the encore! One last song that makes you, you.